I first saw this book reviewed in a literary magazine that I got from the Lockport Public Library. I thought it looked like a very interesting story that was based in history and was very character-centric. It seemed like it would be the type of book that I was go out of my way to read. 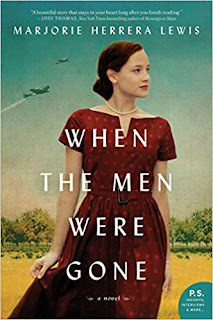 When the Men Were Gone by Marjorie Herrera Lewis lived up to all the hype I gave it from just reading the review. During World War II, the high school football team in Brownwood is on the verge of cancelling the entire season before it even begins as the young men have all gone off to war. With the war raging, there were no men to coach the football team. Some have come back shadows of the men they once were. Some came back to be buried. The real life story of Tylene Wilson, a woman who worked at the school then becomes the focal point of this historical novel. Tylene was a football lover from a very young age, when she would go to the games with her father and call out plays from the stands that the team should do. Over the years, her interest in the game never wavered. As an adult educator, she has a close relationship with the athletes who make up the school’s team. When there seem to be no viable candidates to lead the young men on the gridiron, Tylene finally decides that maybe she could be the coach of the football team. From the moment she is approved by her boss to be the football coach, every obstacle is thrown in her way. Even the boys under her tutelage question whether she can be their coach and are hesitant to perform for her. The school board even calls a special meeting to determine whether the season should be cancelled regardless of Tylene’s insistence that she can do the job. People around town were suddenly cold towards her, and the opposing coach threatened to forfeit the game rather than play against a woman. This historical novel was based on the real life experiences of Tylene Wilson of Brownwood, Texas. All the overt sexism faced by Tylene was very real, even in a small town where everyone knew her and respected her. The ingrained walls between men and women were too great to be broken down even among friends. She was steadfast in her self-belief and persevered despite all the challenges. 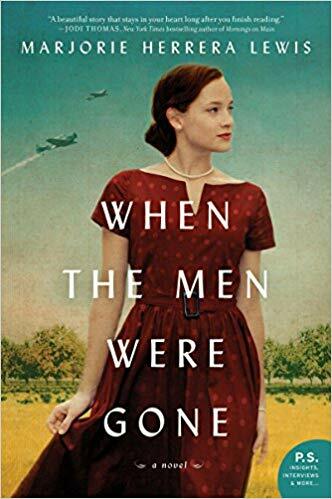 When the Men Were Gone by Marjorie Herrera Lewis is an excellent snapshot at a time period in American History. While the men were off to war, women filled the jobs that were formerly held by those men. We got the visual of Rosie the Riveter, as the women showed us that they could do just as good a job as their male counterparts. This novel gives us a glimpse at another part of our history, a part that has been overlooked. While this book is shorter than most of the books I read, I really enjoyed it. I did finish it in one evening. I always enjoy a book that is very character-centric, as this one is. Add in the fact that this book is based on a true story, and we have a winner in my opinion. I had to look up more about Tylene Wilson after reading this book. It is unfortunate that there has not been much written about her. Hopefully, that will change. Craig Bacon loves reading about real people and real events. He also enjoys reading historical fiction as it gives a deeper look into specific time periods.